First of all, the homeowner had already called out THREE different companies before me. All the big names around here - the big wildlife companies that advertise the biggest and best services, and of course these companies charged a hell of a lot of money just to come out and fail. Then I came out, and sure enough, it was a very difficult job. I searched for almost two hours. The home really smelled bad, but there was no way to pinpoint the source of the odor. I sniffed my freaking nose off at this place. I knew that there was a chance that it was a dead animal under the bathtub, since opossums will often crawl under a house and up the gap around the drainage pipe and under the tub. However, the perimeter of the tub was surrounded by bathroom tile. I'll make the story short: after many attempts and a hell of a lot of persistence, I drilled an exploratory hole into the area from a different room and found a live maggot, which is all I needed. I used my telescoping inspection mirrors and fiber optic scopes and best saws and got the damn thing. Here it is, as shown above in the photo. No one else would have gotten this dead animal. I mean, few people on earth. So anyway, I removed it, disinfected, and fixed the hole. I feel justified in my bragging. 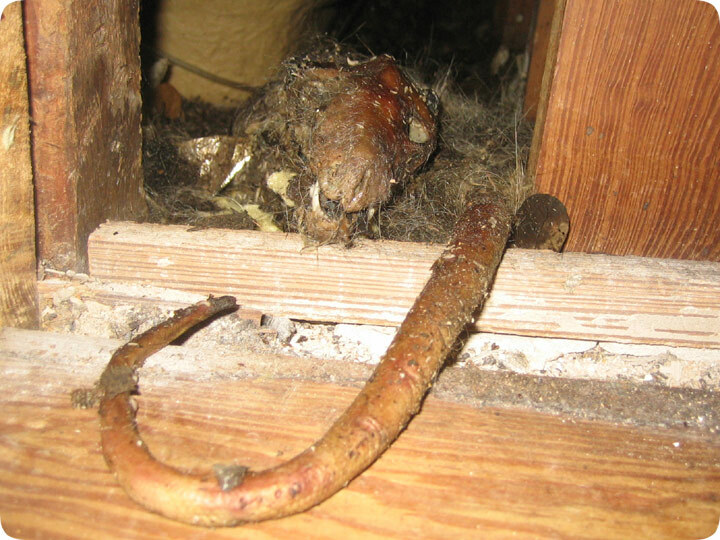 If you have a dead critter in your house, the job may be simple, or it might be complex. A few moments of sniffing around will tell you. If you don't find it within ten minutes, prepare for a long and difficult search, involving cutting open your house.